Thank you for commenting on my research. Naturally I do not control the press coverage and agree with you that it is often inaccurate and sensational. Also, in the example that you quote you say “Set to a broader setting, the machine found 47 of the 70 gay men, but also labelled 53 straight men as gay.” and dismiss the accuracy as negligible. But this is a nearly seven-fold improvement in precision over not using a classifier! And yes, 53 people were straight, but 30 would be straight even if the classifier was perfect – we were looking for 70 ‘targets’ among 100 cases. Finally, it is interesting that no one seems to be talking about the main issue here. What if it is true that technologies already widely used by companies and governments can be use to invade people privacy? Many well-meaning people, including Gay rights organizations, dismiss the results as a junk science. The study could be wrong. But what if they are wrong when dismissing it? In such case they are putting at risk the very people that are supposed to be protecting. Diagnostic tests are used by doctors on people who present symptoms or exhibit risk factors. Universal testing of everyone for, say, HIV status, would result in very high numbers of false positives. And that’s using tests with higher specificity and sensitivity than the AI described here could ever achieve. Of course diagnostic tests are cross-checked with clinical work. You can re-test for HIV, and then monitor T-cell counts, for instance. 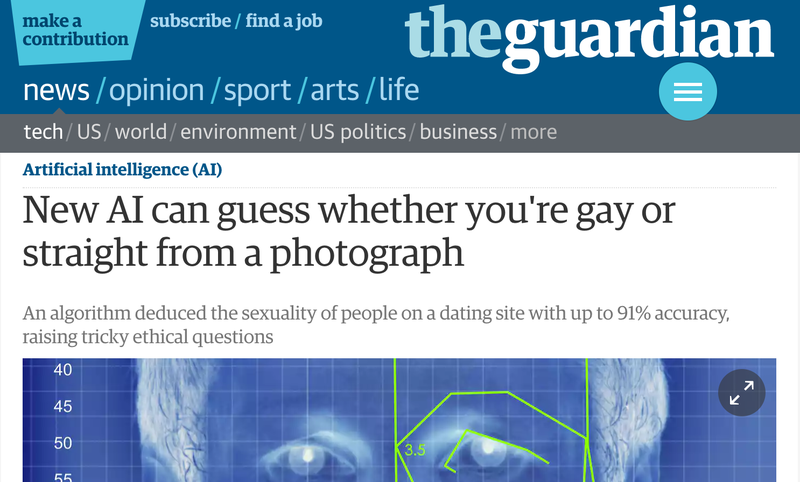 My point in using the probabilities that are provided in the paper is to evaluate the Big Brother scenario where a government surveils the public and deploys this tech to apply discriminatory policies to gay men. This is exactly the scenario that Michal Kosinski and coauthor reportedly raise with the Guardian editors [“the authors argued that the technology already exists, and its capabilities are important to expose so that governments and companies can proactively consider privacy risks and the need for safeguards and regulations.”]. Any any level (including the appropriate level of 70 selected out of 1,000), it produces a huge constituency of false positives. If Big Brother plus AI ever got deployed, numerous government officials would be falsely accused and suppress the program. What is more plausible is person-to-person face recognition, i.e., do you look like one of the people on gay dating sites? These could actually pose problems for closeted LGBT people (and all kinds of other people engaged in clandestine, but electronically recorded behavior) and deserve closer scrutiny. But they don’t rely on a putative physical difference between gays/lesbians and heterosexuals, but on the actually existing problem of Big Data aggregation and advancing biometric technology.